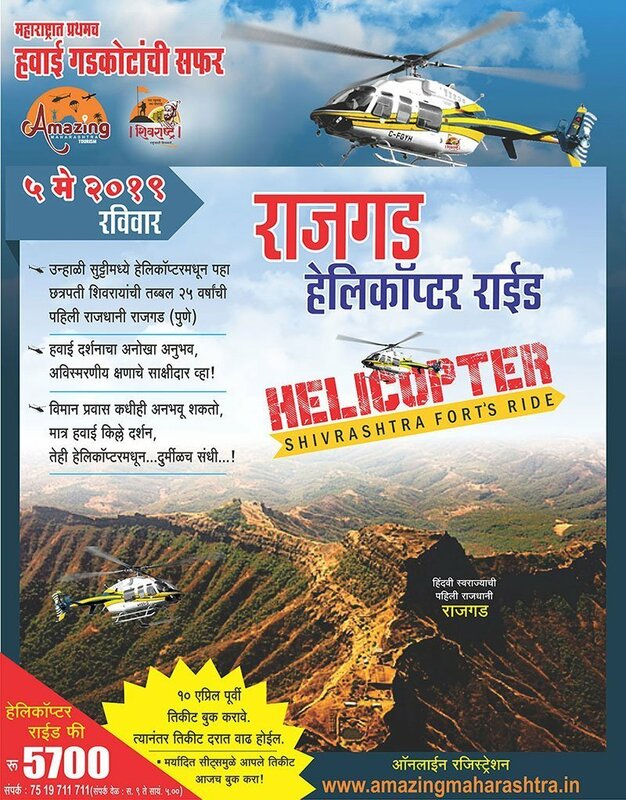 Rajgad helicopter ride 5 May 2019 Sunday 🚁 राजगड हेलिकॉप्टर राईड 🚁 5 मे 2019 – रविवार | First time in Maharashtra. Watch the Shivaji Maharaj Forts from helicopter in low cost. 🚩छत्रपती शिवरायांची तब्बल 25 वर्षांची पुण्यातील राजधानी दुर्गदुर्गेश्‍वर राजगड …! तीन माच्यांनीयुक्त…अजोड बांधकाम अन् अनेक घटनांचा साक्षीदार राजगड…! हाच पराक्रमी, शौर्यशाली राजगड पहा हेलिकॉप्टरमधून. उन्हाळी सुट्टीमध्ये महाराष्ट्रात प्रथमच गडकोटांची हवाई सफर मालिका!🚁 अमेझिंग महाराष्ट्र टुरिझम व शिवराष्ट्र हायकर्स- महाराष्ट्र आयोजित हवाई दर्शनाचा अनोखा अनुभव, अविस्मरणीय क्षणाचे साक्षीदार व्हा! विमान प्रवास कधीही अनभवू शकता, मात्र हवाई किल्ले दर्शन, तेही हेलिकॉप्टरमधून…दुर्मीळच संधी…! मर्यादित सीट्समुळे आपले तिकीट आजच बुक करा! 🎫तिकीट बुकींगची 11 एप्रिल 2019 अंतिम तारीख आहे. सविस्तर माहितीसाठी :- www.amazingmaharashtra.in या वेबसाईटला भेट द्या. Disclosure : All information on findtours.in is based on extensive internet research & information from resources such as local newspapers, radio broadcast etc. findtous.in is not responsible for its authenticity of the services offered by event managers. Readers are suggested verify the authenticity, reliability and integrity of the event / trip / tour / fesival / information. findtours.in team was not compensated for this post by the event managers nor promoting the products. Visiting event or Purchase of product is readers own responsibility. findtours.in will not be responsible for any costs, consequences or damages caused to any persons or entities due to any unauthorized use of the services offered by organizers, product sellers.